Eduardo Mac Entyre studied technical and industrial drawing before beginning his artistic career towards the end of the 1940s. From his earlier works, it is important to note a series of harbor landscapes that gave an early indication of his tendency towards cubism and abstraction. Cubism was later present in a series of still lifes and human figures that were small format works distinctly different from the rigorous constructivist works then prevalent in art from the Rio de La Plata region. Mac Entyre used geometric forms outlined in soft contours that combined the symbolic and the organic. The rough outlines of the forms as well as the lyric and subjective character of these abstractions, were the hallmark of his work during the 1950s. In 1960, Mac Entyre founded, with Miguel Angel Vidal, the Grupo Arte Generativo. 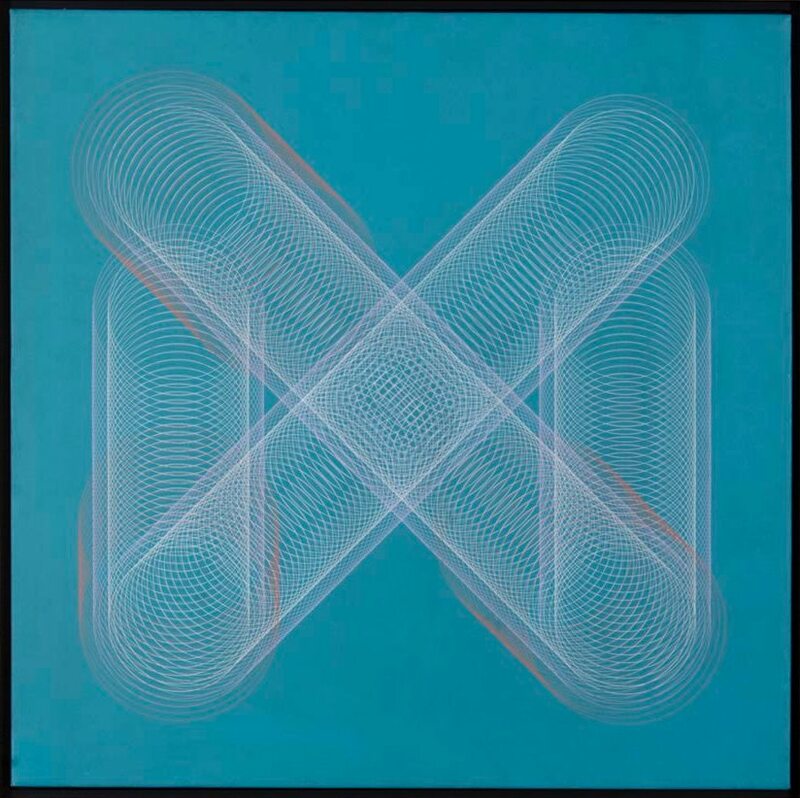 Inspired by the theories of Ignacio Pirovano, this group’s ideas for painting spread widely in Argentina and internationally because they proposed a new way for concrete art to evolve towards kinetics and Op Art. In generative art, linear geometric forms (curvilinear in the case of Mac Entyre), drawn with mathematical rigor, moved on the picture plane and, illusionistically penetrated it. According to the Generativo manifesto, signed by Mac Entyre and Vidal, these virtual spaces and movements “were generated” or “born” by the rhythmical and sequential displacement of lines and superimposed forms that gave rise to a superior geometric form. Beyond his creations in the area of generative art, which Mac Entyre has been continuously developing, he has also produced more subjective works, influenced by metaphysics and the primitive. Examples of the latter works are Paisajes Imaginarios, informalist works displayed at the Galería Praxis (Buenos Aires, 1991), the series Cristo la luz, donated to the Foundation Maria Calderón de la Barca to the Pontificia Academia Scientiarum of the Vatican (2000) and his work entitled Arte africano, a sort of personal encounter with abstract art in which Mac Entyre produced, by means of graphical reduction, a series of drawings, paintings, and serigraphs inspired by African masks and statues. His last works, presented at the Centro Cultural Borges and at the Galeria Arroyo (Buenos Aires, 2000 and 2001), has been widely praised. Eduardo Mac Entyre lives and works in Buenos Aires, Argentina. Presta, Salvador. Arte argentino actual. Buenos Aires: Editorial Lacio, 1960.